I love it when a brand new recipe turns out even better than hoped for. That’s what happened when I made this Sausage and Gravy Breakfast Casserole for a Ladies’ breakfast at our church a few weeks ago. I was looking on Pinterest ahead of time to find assorted breakfast casseroles to make because they are easy, can be prepared the day ahead, and the gal who recruited me for this job wanted “protein.” I stumbled upon this recipe and it really intrigued me, so I decided to give it a go. 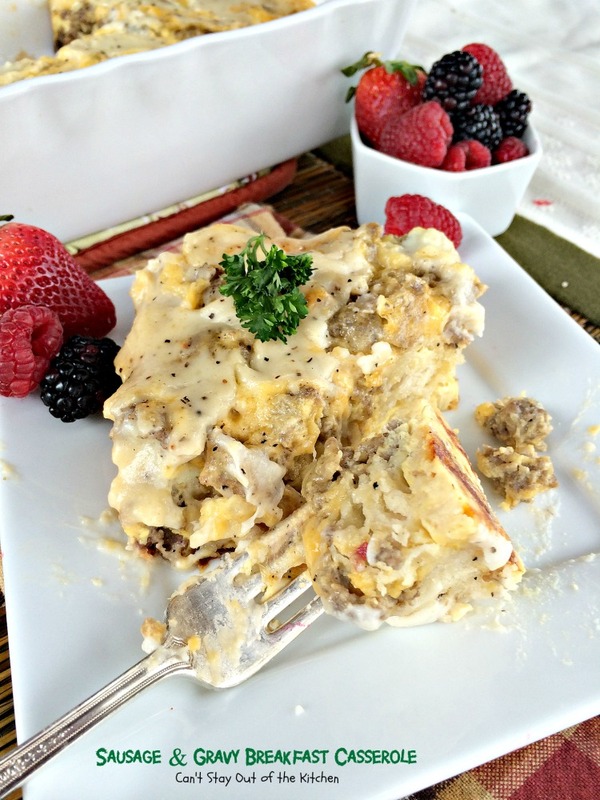 I just couldn’t resist the idea of making a layered breakfast casserole that tasted like eating biscuits and gravy. As it turned out, the Ladies’ Conference was first postponed, then delayed, and finally shortened due to several ice and snow storms that whipped through Dallas for several days during that period. (Yes, you heard that right, Dallas and ice storms!!!!) I had all this food prepared and the roads were too icy and dangerous to travel on, so the food was delayed an additional 24 hours and served on Sunday instead….but this time, not just for the ladies but for the whole church! I made sure all the guys coming through the food line saw this particular casserole out of all the different ones I made and asked them to try it. I surveyed at least 20 people and without exception, everyone LOVED it. 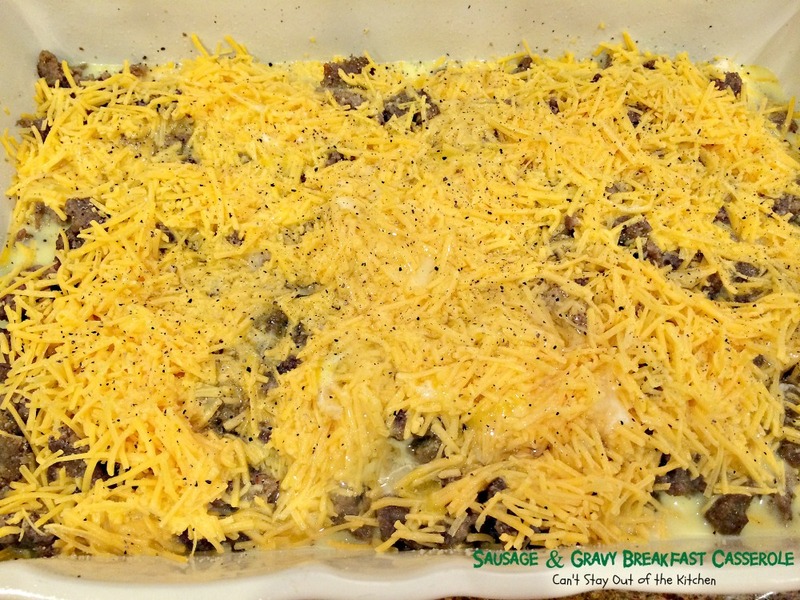 Not only that, even the kids and gals who tried Sausage and Gravy Breakfast Casserole enjoyed it as well. I actually made two large casseroles for the church (equivalent to three total casseroles) and one casserole for us. I baked the one for us after about 5-6 hours of refrigeration and all I can say after eating one bite was that this casserole really delivers. It’s like eating biscuits and gravy, but the eggs and cheese add a delicious twist by making this more like a breakfast casserole. My husband also had several large servings. Sausage and Gravy Breakfast Casserole is absolutely one of the best breakfast casseroles you’ll ever eat. 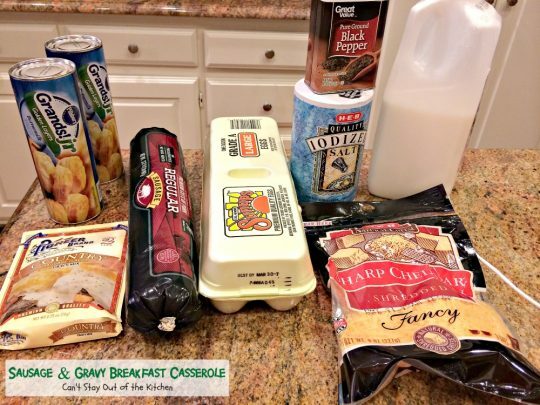 If you like biscuits and sausage gravy, then you’ll love this version with eggs and cheese added. It’s a great breakfast idea for holidays like Easter or Father’s Day, or other special occasion brunches or breakfasts. After you make up a batch for your family, I believe you’ll agree. 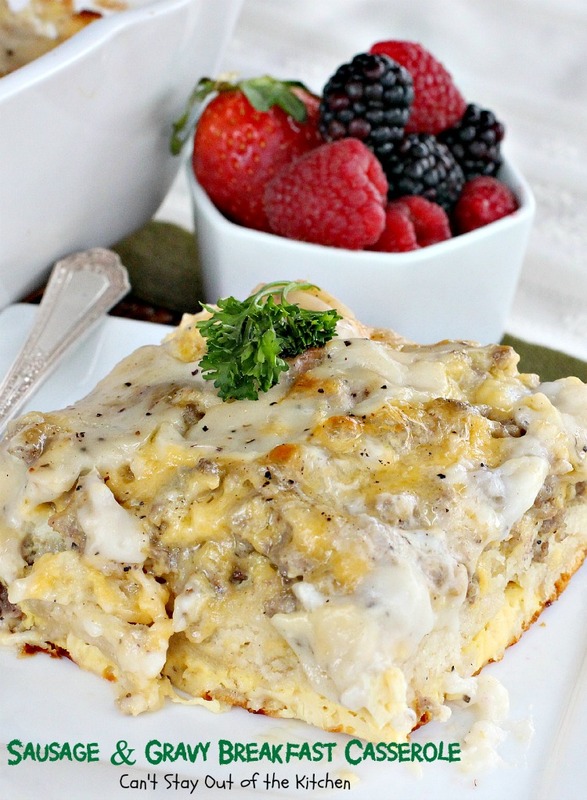 This amazing breakfast casserole is featured at All Free Casserole Recipes here. 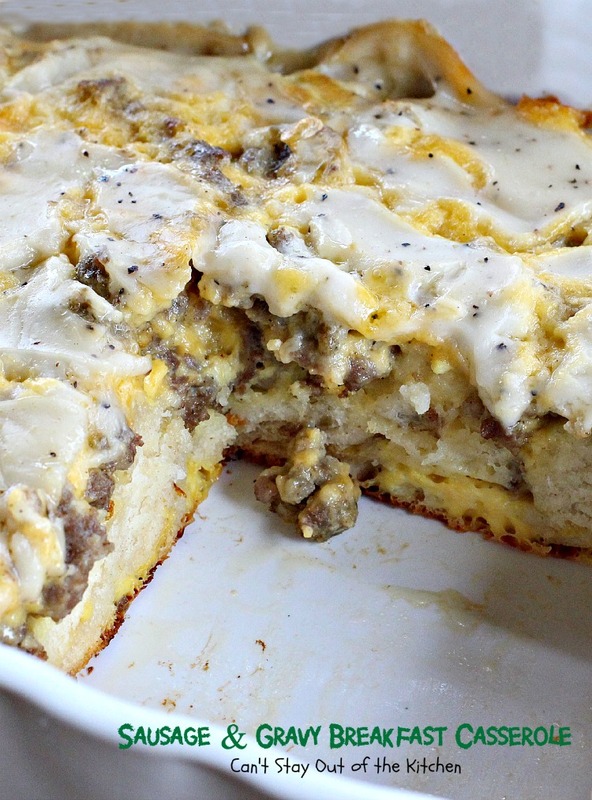 Sausage and Gravy Breakfast Casserole is one of the best breakfast casseroles you’ll ever eat. 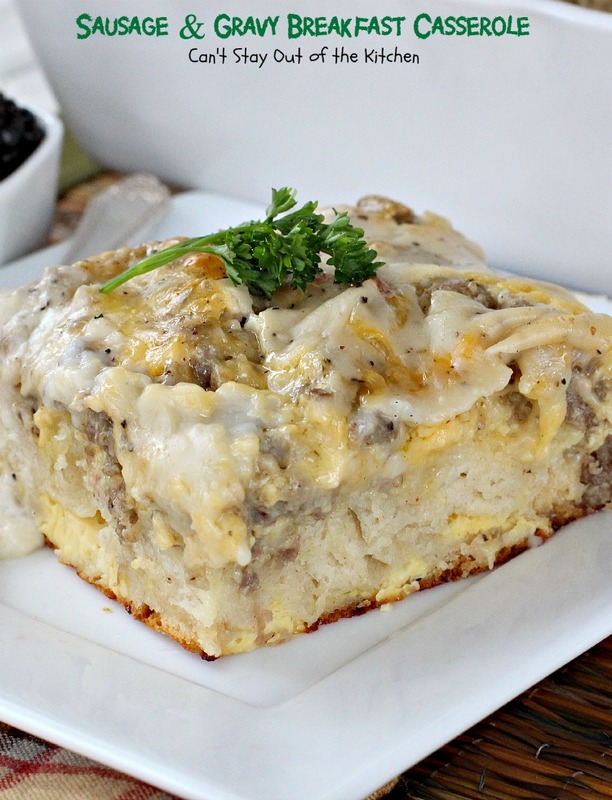 Sausage and Gravy Breakfast Casserole is made with biscuits, sausage, cheese and pepper gravy. It has one of the most marvelous flavors and textures of any breakfast entree you’ll ever eat. No kidding! 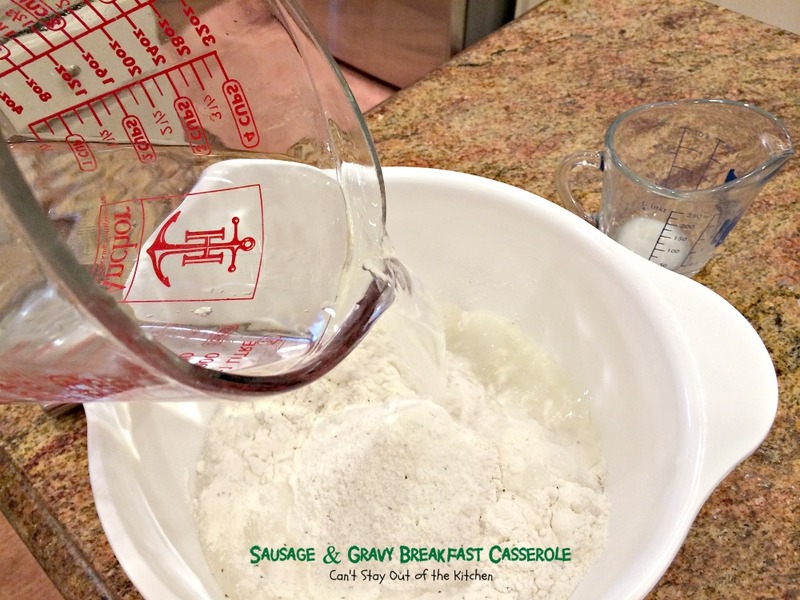 Spray a 9×13″ glass baking dish with cooking spray. Unroll a can and a half of Pillsbury’s Grands, Jrs. Biscuits. Cut each biscuit in quarters and place on the bottom of prepared baking dish. Brown sausage and drain. Crumble into small pieces and sprinkle over top of biscuits. Spread cheese over top. Sprinkle generously with salt and pepper. Whisk eggs and milk together and pour evenly over top. Prepare sausage pepper gravy according to package directions. Heat water in saucepan and bring to a boil. Meanwhile, mix dry gravy mix with cold water and whisk to combine. Once water comes to a boil, add moistened gravy mix and whisk continuously until mixture thickens. Pour thickend gravy mixture over top of cheese layer. Cover and refrigerate overnight. (You can also bake this immediately, if desired). If you bake immediately, you will only need to bake for 30-45 minutes at 350. Bake at 350 about one hour or until hot and bubbly. 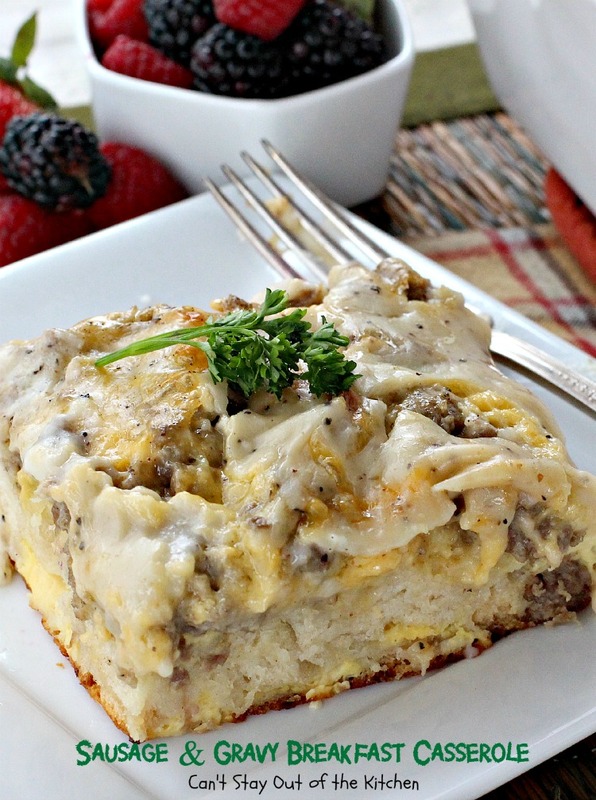 We found this Sausage and Gravy Breakfast Casserole absolutely incredible. 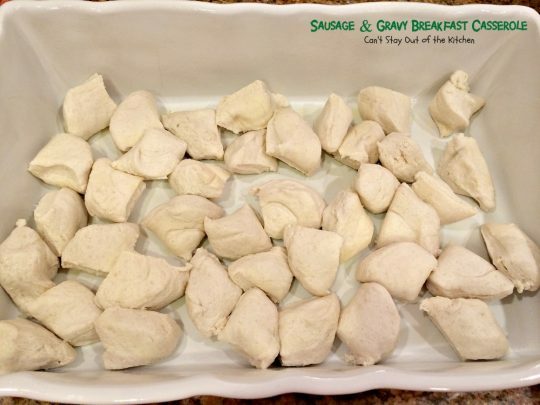 Put this tasty recipe on your next holiday breakfast menu! 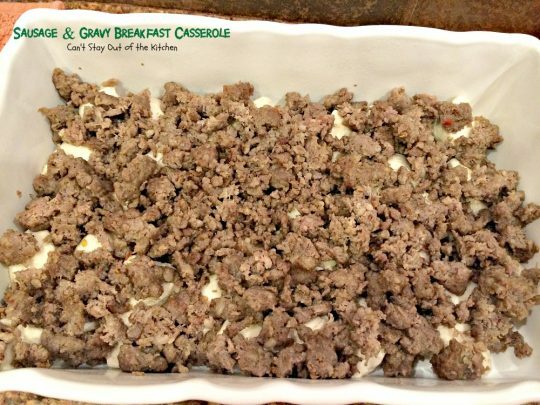 This amazing breakfast casserole is great for holiday breakfasts and tastes like eating sausage gravy over biscuits but in casserole form! Crumble cooked sausage over top. Pour evenly over top of cheese in casserole dish. Once thickened, spread over top of the cheese mixture in baking dish. Bake at 350° approximately one hour or until bubbly and cooked through. NOTE: The directions for my gravy mix called for 1 ½ cups of water to be brought to boiling. Stir the contents of the gravy mix into ½ cup water and whisk to incorporate. Once water comes to a boil, add gravy/water mix and whisk until thickened. (I was making four packages at once so it took about 5 minutes for the gravy to thicken appropriately). NOTE: Preparation time does not include time required to refrigerate overnight. NOTE: You can also bake this casserole immediately without refrigerating it overnight. Bake time will probably shorten to 30-45 minutes. Recipe adapted from Scattered Thoughts of A Crafty Mom. 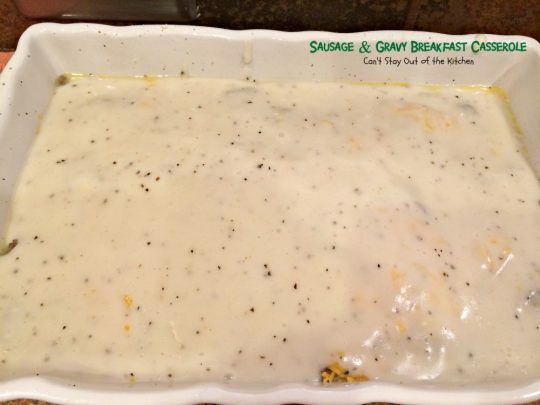 This amazing breakfast casserole is great for holiday breakfasts and tastes like eating [url href=”http://cantstayoutofthekitchen.com/2013/04/08/sausage-gravy-and-biscuits/” target=”_blank” title=”sausage gravy and biscuits”]sausage gravy over biscuits[/url] but in casserole form! Place in the bottom of a greased 9×13” baking dish. The directions for my gravy mix called for 1 ½ cups of water to be brought to boiling. Stir the contents of the gravy mix into ½ cup water and whisk to incorporate. Once water comes to a boil, add gravy/water mix and whisk until thickened. (I was making four packages at once so it took about 5 minutes for the gravy to thicken appropriately). [br][br]Preparation time does not include time required to refrigerate overnight. 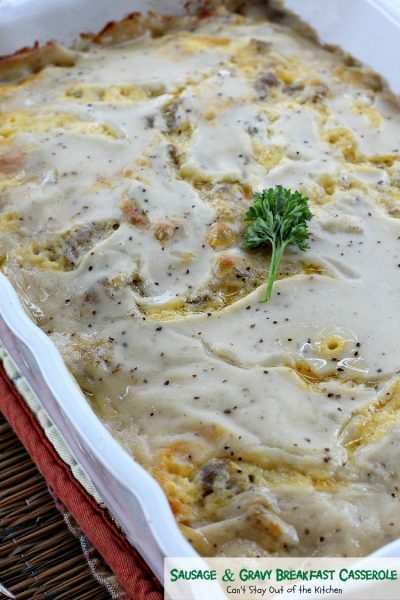 [br][br]You can also bake this casserole immediately without refrigerating it overnight. Bake time will probably shorten to 30-45 minutes. If you enjoy Sausage Biscuits and Gravy, you’ll love this breakfast entree. Doesn’t Sausage and Gravy Breakfast Casserole look wonderful? Delicious & Easy recipe. I substituted biscuits for crescent rolls. Worked great. Wow that sounds wonderful. So glad you enjoyed the recipe. Hi, Bev, I bet that will be wonderful! Enjoy. Hi Teresa! I was wondering if you can make this with homemade Bisquit bisquits? Hi Barb. I’m sure you could make it with homemade biscuits. If you didn’t mind the extra work, it would probably be terrific this way. I would just make sure to shake off excess flour before using them. Hope it turns out well for you. My husband and I trippled this recipie to provide a meal for a local ministry feeding approximately 35 homeless people it was delicious!!! Hi, Catrina, I’m so thrilled that it turned out so well and for so many people! It really is a terrific recipe and not overly difficult. Thanks for letting me know. I really appreciate it. Have a great week. Hi, Matt. I’m sure you can, I’m just not sure how many cups of gravy you need to make. You may have to find out how many cups the package makes and then substitute accordingly. Matt, you will also have to make a milk gravy, not a brown gravy. Thanks for the tips, AJ. Instructions say to cut the biscuit dough into pieces and line the pan, do you mean just set the pieces in? Or are they to be pressed in? Hi, Sandra, I just set the pieces in. I didn’t press them into the casserole. Hope that helps. That may work, Melody, if you add the sausage and gravy mix after layering with the cheese (when you would normally be pouring the gravy mix over top). Do you bake this covered or uncovered for an hour after refrigerating it overnight? I think I bake this uncovered, Lori. But if it looks like it’s getting too browned, then I would tent it with foil. 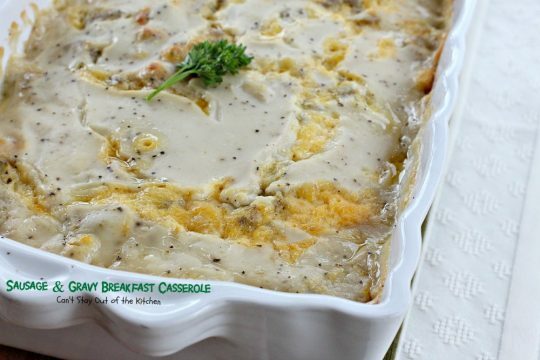 This casserole is so yummy and satisfying for breakfast (or supper!) I have made it a couple of times with a batch of homemade biscuit dough when I didn’t have the canned biscuits on hand. While it takes a little longer to make, it turns out just as delicious! My family loves this! Thanks for sharing the recipe! Hi Dmarie. I love the idea of making this recipe with “real” biscuits. I’ll have to try it that way next time. So glad you are enjoying the recipe. Hi Jessica. I really would not recommend freezing it. It will last in your refrigerator several days (after baking), but I wouldn’t freeze it because I’m afraid the biscuits used would not hold their consistency and get kind of gooey. This looks amazing. And plan to make it. Is there a way to add diced up potatoes. Do you think the hour cooking time would cook the potatoes enough? Or even baking it right after its prepared would the cooking time fully heat the potatoes? I’m sure you could add potatoes, but you do need to be prepared to add some additional time. You can certainly bake this right after preparing it. Oops! Didn’t mean to post twice! I thought it didn’t post the first time. My family and I LOVE this casserole! We are going on vacation in a few weeks, and I’d love to make this for an easy breakfast one day. In desperate attempt to make this even easier (because I try to do as little as possible when I’m on vacation! Lol! ), I’d like to know if it is possible to prepare this in advance and freeze it (with raw eggs). Has anyone done that before? If so, how did it turn out? My family and I LOVE this casserole! We are going on vacation in a few weeks and I’d love to make this for an easy breakfast one day. In desperate hopes to make it even easier (because I try to do as little as possible on vacay! LOL! ), I’d like to know if this could be prepared in advance and frozen (with raw eggs). Has anyone done that before? If so, how did it turn out? I haven’t done it and frozen it before, Amanda. But you can make it 24-36 hours ahead of time before baking. That’s what I ended up doing the first time I made it. Still turned out wonderfully. Can you make this recipe and omit the egg??? Hi, Mikki. You may be able to do that but it the casserole may not have enough moisture and cook up a lot differently. Unless you’re allergic to eggs or just hate them, I’d make it with eggs. Otherwise, you can always give it a try and see how it works. You will still have to use milk or something to make the custard like layer with the cheese. Hope it turns out for you. I made this last school year for a teacher’s breakfast at my daughter’s school & it was a huge hit. Tomorrow there is a back to school breakfast for the teacher’s and they asked me to make it again! Last time I made one for the school and one for us to eat and this time I split ours into two smaller casseroles. One for my husband and I (my daughter is now a vegetarian) and another for a neighbor. Thank you! PS….. There was more than plenty for 8 people in that casserole… everyone had 2nd…. that’s why we ran short lol! Just any fyi that it indeed makes 12 servings. Thanks again. I’m so glad you enjoyed it so much that everyone had seconds! Ok Teresa…. I’m baaaack! 🙂 I made the casserole for Father’s Day and WOW… what a success! Everyone absolutely LOVED it! I used a 13 x 9 glass casserole dish and thought there would be more than enough for 8 people (was 12 servings) and it was gone in less than an hour lol! I even had 2nd on this one! My new go to breakfast/brunch casserole. ps… I followed the recipe as stated and did it the night before and cooked for an hour the next morning while I was getting ready… couldn’t have been easier. Thanks so much for the great find! This is such a fabulous recipe. Who would have ever thought sausage, biscuits and gravy in casserole form could be so good??!! I hope you enjoy it. I just tried this recipe today. It was delicious! I can’t wait to share with the family. Thanks! I’m so glad you enjoyed it, Ryann. We really thought it turned out quite well, too. 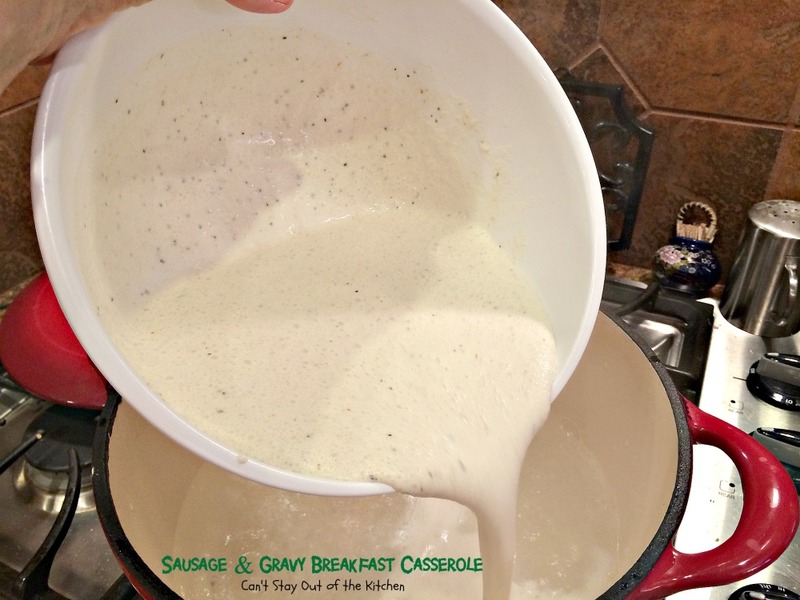 I love sausage gravy and biscuits so this recipe really hit the spot. Thanks for stopping by. It was so awesome, Kim. This recipe is a keeper for holiday breakfasts, for sure. Thanks so much for stopping by. All I can say is wow, Teresa! That looks spectacular. I have never heard of anything like it. My husband would love this. Pinning for sure! I had never heard anything like it either, Shari, until I saw it on Pinterest. All I can say is it was FANTASTIC!!!!! My husband loved it and so did everyone else I served it to. I hope you try it for Easter or Father’s Day or another special breakfast!